Carrot Cake Protein Shake was posted on April 7th, 2012 and is filed under Breakfast, Dairy Free, Protein, Recipes, Vegan. This entry has 18 comments. You can follow any responses through the RSS 2.0 Comment Feed. I usually like to hide veggies in shakes…but this time the vegetable gets the spotlight! I’m trying to shake things up with my smoothies (pun sort of intended) and attempt new flavours. Sometimes I get stuck in a rut…usually chocolate or green smoothies are my go-to shake. However, it’s good to have some variety. This is a sweet, creamy shake that is great for after a workout! Or maybe it’s your solution to getting your kids to eat their carrots. It’s full of nutritional goodness and it’s pretty yummy too! I recommend that you use carrot juice (Bolthouse Farms has a delicious juice!) instead of almond milk when blending for a stronger carrot flavour. 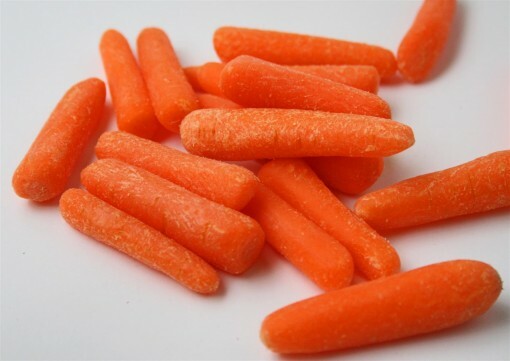 Unfortunately, I didn’t have any in the house…so I went for a milder carrot flavour with organic baby carrots. This serves 2. Blend in your high-speed blender. Pour into two glasses and top with crushed walnuts. Enjoy! Pour one tall glass…or share with someone! Note: Calories will be more or less depending on what kind of protein powder you use. This time of year is really special. It’s not just that we get to hang out with family and maybe relax…I love the Easter story. …And there’s parts of it that I don’t like. On Good Friday we remember the sacrifice that was made that day. The fact that Jesus was tortured, beaten, and crucified so that He could make a way for us to be with Him forever. Taking my sin and offering me the gift of eternal life…the most beautiful gift ever given. 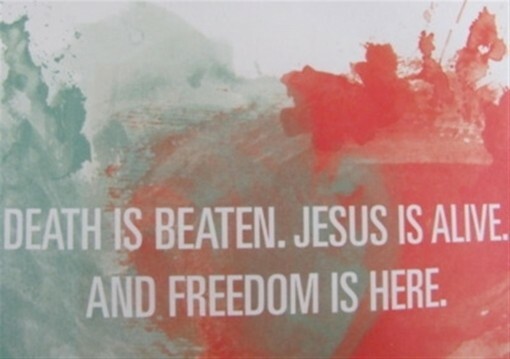 The best part of the Easter story, is when death gives way to life…to victory. The part when the Hero can’t be hindered by such a small thing as death anymore. I wouldn’t want my life in any other hands but His. Easter is such a wonderful time to remember that gift of life! Do you have any special Easter memories? What are you doing for Easter? I remember my Mom always did a Easter hunt for us in the house, then my grandparents would do one in the backyard and have breakfast all set up for us on the back deck. Today I am hosting Easter brunch with my family. A few years ago we decided to forego the typical Easter dinner and have brunch, I love it! I am a HUGE carrot cake fan so I am all over this recipe! Thanks for sharing. I’m curious to try it with coconutmilk in lieu of almond milk for a stronger carrot cake taste? What a great idea!! I’ve never thought to make something like this … but I love making smoothies in the morning. Definitely will be trying this out very, very soon :) Have a marvelous Easter! I love carrot cake, I can’t wait to try this. Thanks for sharing! Khushboo~ That sounds like a great idea…I also suggest you sub half the milk for carrot juice, that would be delicious! Let me know how it goes! Great post! I hope you don’t mind, but I shared a link to it on my blog. Happy Easter! What a great festive smoothie for easter! Yes please! 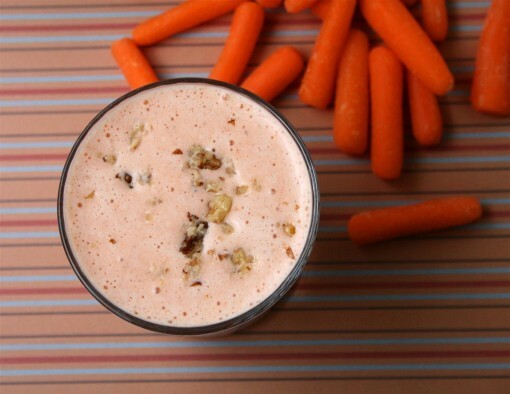 I often use carrot juice in my smoothies… What a great idea to use the entire carrot! I never thought to add carrots to my shake. Great idea! What type of protein powder do you recommend? I have yet to make a smoothie that I like. I think it’s a texture thing! But every few months I give it another try. This recipe makes me want to give it another try! Ha! But I currently don’t use protein powder. Can you please recommend one? Thank you! Rachel Stith~ There are a lot of protein powders I love, but my new favourite is Perfect Fit from http://perfectfitprotein.com/order.php – but I also love organic whey protein powder (check your health food store). I will definitely give this smoothie a try – thank you for sharing. I am new to your website but I did just try the Lara bar recipe last night and it was excellent! (I love Lara bars too.) I look forward to more posts. Blessings to you and Happy Easter. I was having a serious sweet tooth tonight, and this caught my attention. How fun! I didn’t have any more bananas, so I used cashews instead to make it ‘creamy’, but i’ll have to get some more bananas. Thanks for a great shake post! !